Since usage of aluminium cylinder heads, valve seat inserts have significantly gained in importance. Together with the valves they seal off the combustion chamber of the cylinder head. The valve seat insert prevents the impact/burying of the valve into the cylinder head. It absorbs a proportion of the combustion heat with which the valve is charged. The valve seat insert gives off this heat to the cylinder head. To meet the different strains, an optimum material composition of the valve seat inserts must be found. Not only must the operating conditions in the engine be considered, but also the machinability of the material for the engine reconditioner. In the most recent engine generations of renowned car manufacturers, valve seat inserts made of sintered material (powder metallurgical procedure) are used. The increasingly high, thermal strain of the seat insert in the combustion chamber can hardly be met anymore by materials from conventional casting processes. For this reason, Motorservice offers sintered valve seat inserts amongst others from two different material combinations, which covers the entire application range of future engines. This material combination is characterised by its excellent machinability. The sintered HM valve seat insert has a composition of tungsten carbide precisely adapted to the strain, embedded in alloy steel. This way, so far impossible combinations of material properties like high hardness and very good machinability can be combined. Furthermore, the HM series has good wear resistance and good heat resistance. The HM series was developed for naturally aspirated and turbocharged engines from the bottom to top performance segment. This material combination is characterised by its high wear resistance, which also withstands extremely high temperatures. The sintered HT valve seat insert corresponds to ceramic tool steel made of tungsten carbide, with respectively adapted, high temperature resistant additives embedded into its matrix. Due to the large amounts of permanently embedded lubricants, these rings are especially suitable for high performance, highly charged, highly strained Otto and diesel engines. Despite the high strain on these engines, "micro-welding" of the valve seat insert and the valve is prevented. The field of application of the HT valve seat insert includes especially highly strained engines.This material was developed fro dry fuels like CNG, LPG and Flex Fuel. This material combination is characterized by a very high wear resistance even at extremely high temperatures. The material composition of the HT+ valve seat inserts shows an average strain of the cutting material and simplified machining properties despite increased wear resistance. The combination of ceramic tool steel made of tungsten carbide and the large amounts of permanently embedded lubricants is especially suited for dry combustion occurring in gas utilizations such as LPG, CNG, propane gas and Flex Fuel. Another application for high performance Otto and diesel engines, for example, is also possible. 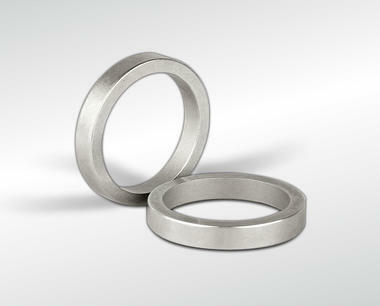 In addition, the HT+ valve seat insert shows excellent thermal conductivity properties. Despite the high strain on these engines, "micro-welding" of the valve seat insert and the valve is prevented. The G1 series consists of a highly heat resistant grey cast iron alloy with the additives chromium and molybdenum. The G1 series has been developed for a large application area and is mainly used for utility vehicles. This valve seat insert has a composition of annealed martensite precisely adapted to the strain, with a distinct carbide network. This valve seat insert thus has good wear resistance and is highly heat resistant. The G2 series consists of a highly wear resistant grey cast iron alloy with a high proportion of the additives molybdenum and vanadium. This material combination is characterised by its high wear resistance, which also withstands very high temperatures. It is a high-alloy material with a distinctive, closed network of composite or special carbides respectively in a martensitic matrix and evenly distributed proportions of solid lubricant. Extreme operating conditions as well as high strains of the respective engine must be taken into consideration and are the responsibility of the engine repairer. The selection of the specification of engine parts must be carefully checked by the engine repairer. DIŞ TİCARET ve PAZARLAMA A.Ş.